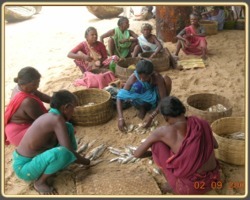 Socio-economic status of the village people was studied and found that their major livelihood is fishing. We could sense the feeling of majority of fishers that they are in need of alternative livelihood since fishing is becoming uneconomic everyday. Seaweed cultivation and its benefits were explained to the fishers and they show interest in the project. 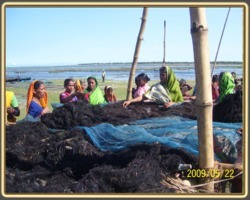 The seaweed cultivation can enhance the income of the coastal communities once it is developed with a viable technology. The water temperature, water motion, depth, cultivation area availability, nature of the substratum and other environmental conditions required for the cultivations were investigated. Fishing has traditionally been considered as a ‘technical’ subject and policymaking has largely been concerned with making the sector more ‘technologically’ oriented. 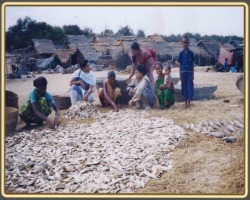 The focus has been on the commodity produced – fish – and less on the people who depended on fish and fisheries, and issues concerning the social and economic aspects of the fisher people’s lives have always taken the backseat in the pursuit of increasing production (specifically earning foreign exchange) through whatever means available. Increasing technologisation has meant increasing capitalisation of the sector and consequent marginalisation of the people who traditionally depended on fisheries. Increased capitalisation has changed the contour of fishing from subsistence-based, local initiatives to export and profit-oriented, international activities, and from group-based egalitarian systems to individually owned and operated marketing ventures. On the face of it, there does not seem to be anything wrong with that, with Indian seafood showing up on some of the most elegant dining tables in the world, earning huge amounts of the much-needed foreign exchange to the country. Except that the new entities, instead of absorbing the old ones (as was hoped by the planners), or being absorbed by the latter (as is the case with many new, people-friendly technologies), became, rather like oil on water, a new sector in themselves, one which is in competition with the old ones, and obviously winning. Powered By : Versatile IT Services (P) Ltd.